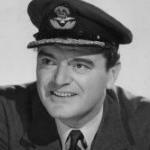 "Jack Hawkins - as long as it's got Jack Hawkins." 'Angels One Five' was made in 1953 and nominated for a BAFTA for 'Best British Film'. Starring Jack Hawkins, John Gregson, Dulcie Gray and Michael Denison it was highly rated at the time though now seems a cliche of the Wartime genre. It follows the trials of a trainee Spitfire pilot during the Battle of Britain. If nothing else it is notable for its use of proper British nicknames such as Septic, Tiger, Bonzo and Batchy! Follow the link to the 'Angels One Five' entry on the Internet Movie database.